I have been unexpectedly absent from the blog for a couple of weeks due to coming down with the flu, a family vacation and some very busy times at work. It’s good to be back chatting with you! We had an all-siblings and family get together to celebrate my father’s 70th birthday. These photos are taken at Mount Maunganui (or looking across from Tauranga to Mount Maunganui) and are my teenage stomping grounds. It was lovely to be on the beach again, feeling the sand under my toes. It was a contrast to Wellington beaches which are mostly rocky, with their own kind of wild beauty. Very different in character to the gentle, soft sand beaches I grew up on. You can see larger images of these pictures by clicking on them. Some knitting has been done, but not much, sadly. I was unusually sick with the flu for several days, which even affected my ability to knit. (Fortunately, I was able to recover enough to attend my family gathering). And work has also eaten significantly into my spare time recently. These projects cover the last two weeks – the cardigan is a Drops pattern that I am modifying as I go. I do not fancy the extended garter lapel in the front, so I will keep it straight edged. The cardigan has enough width without me needing to any extra stitches. I also plan to knit plain sleeves so that the overall effect is not too lacy. The yarn is very special Madelinetosh Pashmina in Tart. A generous gift from a very loving knitting friend. The socks on the top are the finished V-Junkie socks, knit in Knitsch 100% merino sock, and the bottom pair are a plain vanilla pair worked in two colours. I used a now-discontinued indie dyer’s high twist merino sock yarn. They are the first contrasting toe/heel/cuff socks I have made, and I am quite pleased with how they have turned out! They are also an effective way to use up those partial balls of sock yarn that aren’t quite enough to knit a pair of socks out of. I used approx 30gm of contrast sock colour and 60gm of the main colour. One of the unexpected delights of the new place I am living in is the profusion of flowers that bloom in spring. I leave you with a small montage of some of the prettiness I see every day. It gladdens my heart – I hope to share a small piece of that joy with you. My father and I were having a discussion one day about plants, and gardens, and the simple pleasures of enjoying a piece of freshly picked fruit, or delight in a gorgeous bloom. He made the observation that the tree or plant you put in the ground is a gift to future generations, and that we are but temporary custodians of their fruit and beauty. Wise words indeed. Such a simple act of planting can so powerfully contribute to someone’s future quality of life. After all, if it wasn’t for the efforts of previous people who lived in this house, I would not have all this loveliness to enjoy now. I shall look after this garden, and add to it, so that others can continue to enjoy it long after we are gone. A happy weekend to you, and Happy Knitting! 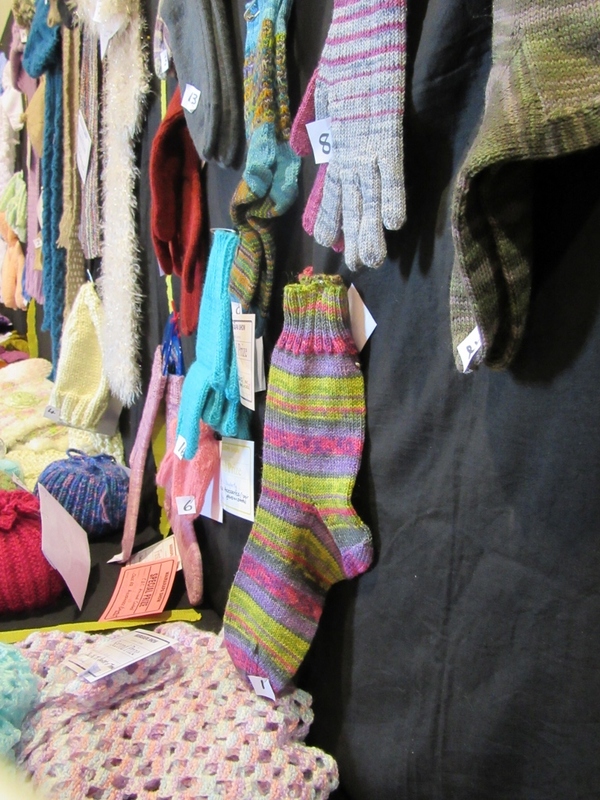 Categories: Inspiration, Knitting, Socks, Wool | Tags: environment, inspiration, Knitting, New Zealand, plants, socks, travel, Wool | Permalink. I promised some photos of the new environs once we got out and about. Today, the eldest boy and I went for a walk by the Hutt River. It was lovely. The sound of the water rushing over the rocks was so restful. The leaves are finally starting to change! It was nice to be close to nature again. I especially enjoyed looking at all the different colours and textures in the rocks. We met some of the locals. I was pleased to be able to get reasonably close to these spur-winged plovers. Their little masks are so cute! It was a lovely interlude. Categories: walks | Tags: Hutt River, New Zealand, walks, Wellington | Permalink. It’s the Wairarapa Balloon Festival this week. The boy and I got up early to go and see the balloons. It was just past dawn when the first one drifted into view. Definitely the most novel of all the balloons! I thought the lighthouse definitely got points for novelty too. The balloonists had set a course to drift over one of two ‘X’s set close to the town square. The balloon that dropped their marker closest to the ‘X’ got the best score. It was awesome to be so close to them! It was interesting to learn that once air borne, it is not possible to change the course of the balloon – they can only go up or down. The skill of the pilot is in calculating how wind direction, speed and shear will affect their balloon’s flight path and launching at the right place. By changing their altitude they can also gain access to differing air streams that can help them to change direction, but it is not an exact science by any means, from what I could see. Not all the balloonists were able to drop their markers – some missed the drop points by quite a distance. Categories: Rural lifestyle | Tags: New Zealand, Wairarapa, Wairarapa Balloon Festival | Permalink. It was lovely to go for an evening walk yesterday. The season is maturing, the berries ripening in time for late summer, the grass seeds golden and ripe. I loved seeing the flowers and identifying all the different plants growing along the roadside. The best things in life are often the simplest, don’t you agree? 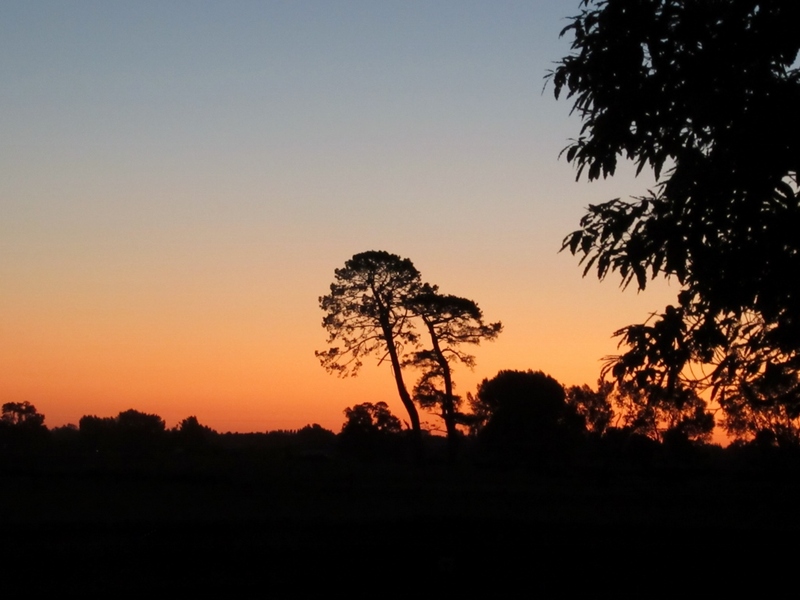 Categories: Country walks | Tags: country walks, nature, New Zealand, rural lifestyle, Summer, Wairarapa | Permalink. Having moved to rural New Zealand, I am determined to enjoy all that being ‘in the country’ (as we say here) has to offer. 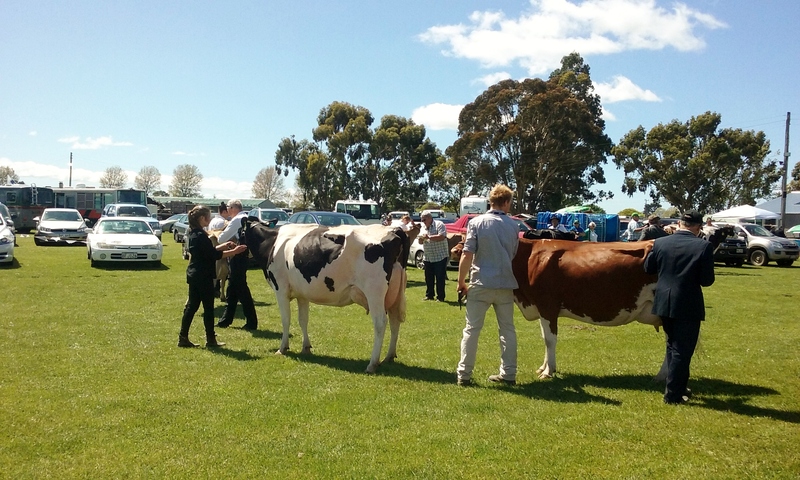 The annual Wairarapa Agricultural & Pastoral Society Show is being held this weekend, so the young man and I trotted along to see what was to be found! 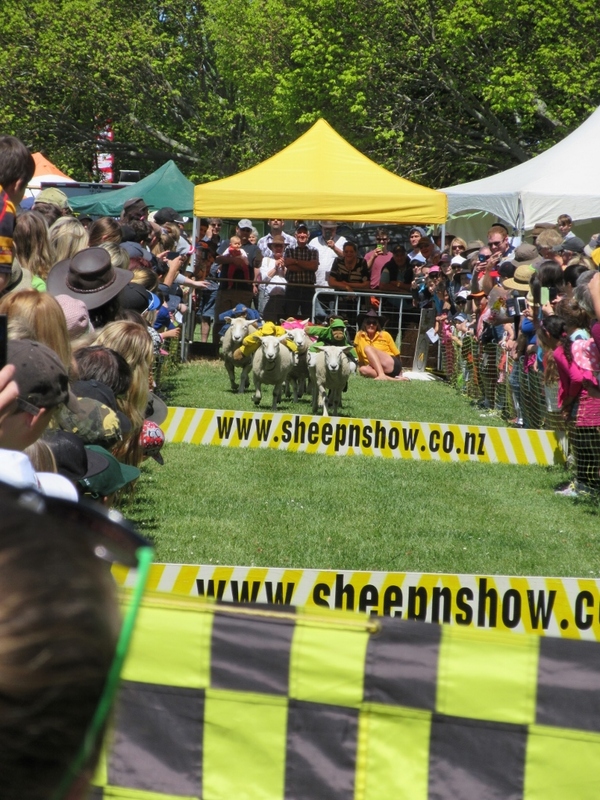 For the benefit of readers who are not familiar with this kind of show, it is a local festival celebrating the best of the rural activity of the area that we live in. 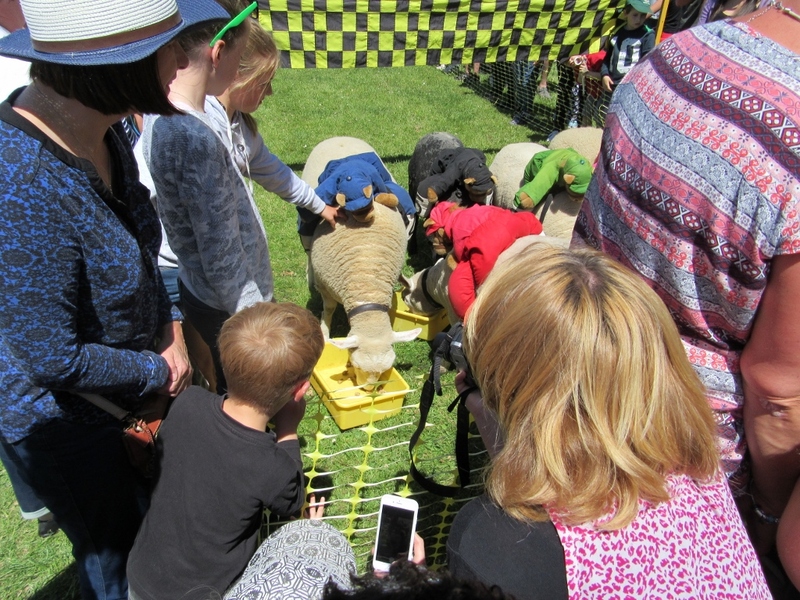 There were sheep and cattle shown for judging, shearing and wool handling competitions, a wood chopping competition, baking and art competitions, agricultural vehicle and other equipment displays, many food and goods stalls and of course, a fairground for the kids. It was a very interesting day out. Well, the first thing that we saw were the sheep! So many pretty sheep!! 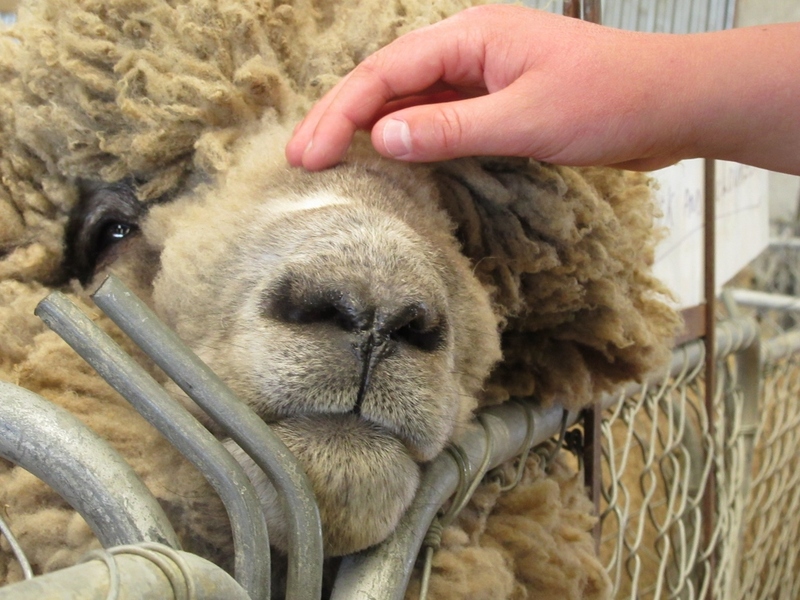 This particular fellow is a champion crossbred ram. 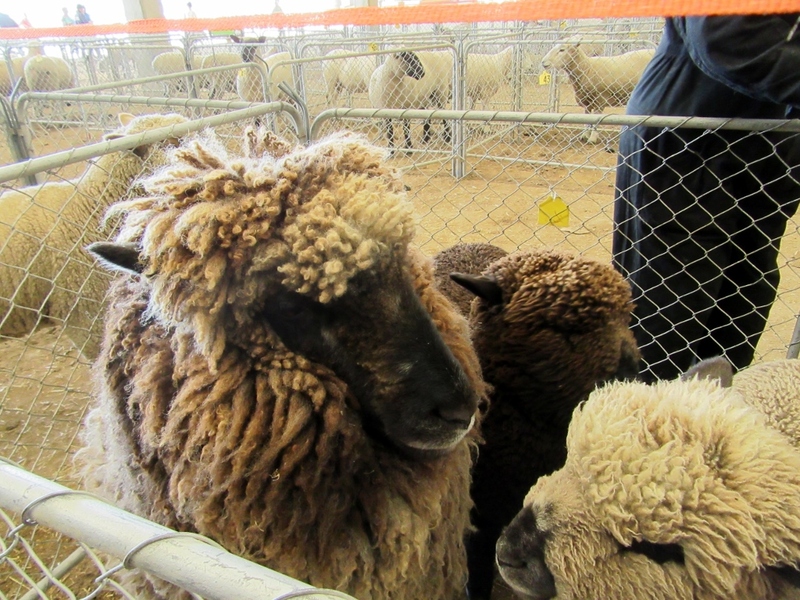 His fleece was incredibly thick – about half of that sheep is wool! He was very friendly. As you can see, he was loving the head scratches. Look at that adorable face! Here was a lovely mama ewe and her twin lambs. So cute, one black and one white. There were also cattle being shown. 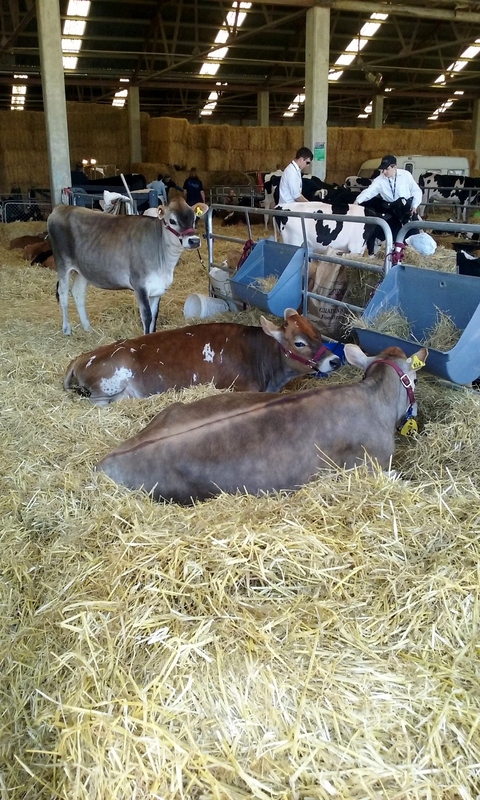 These pretty jerseys were waiting their turn to be judged. I’m still thinking about those chickens. I want some so much!! There was yarn to be seen, but not bought. 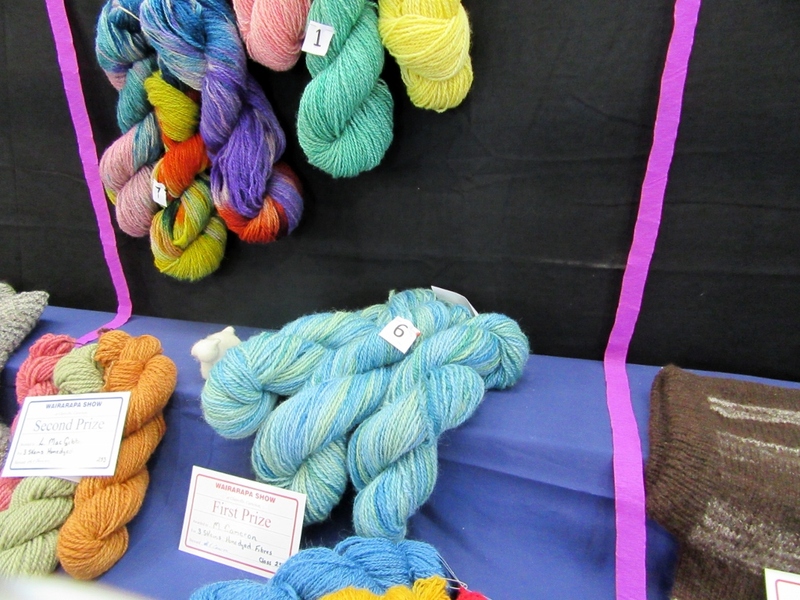 These skeins were handspun that had been entered for the competition. 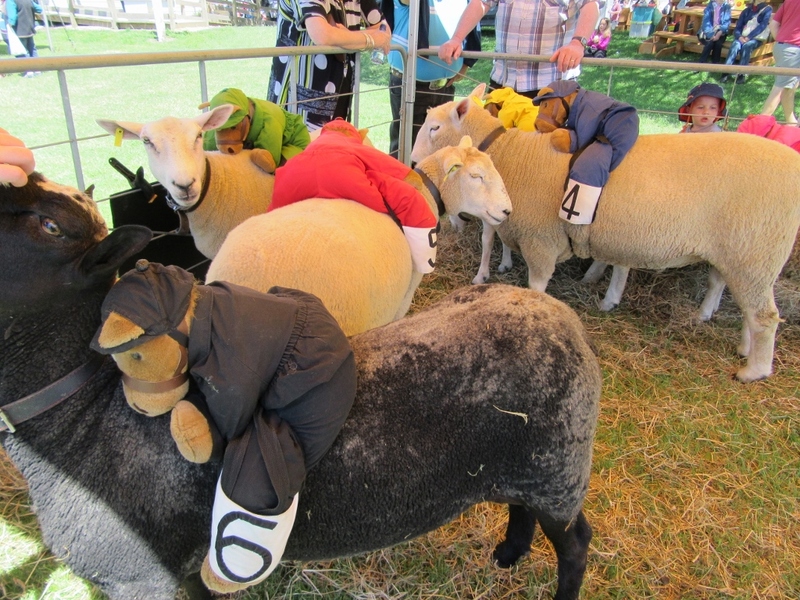 There was a hilarious sheep racing competition, complete with jockeys! Here they are at full gallop. The first one to the end got to eat the most sheep nuts! There were riding events happening. 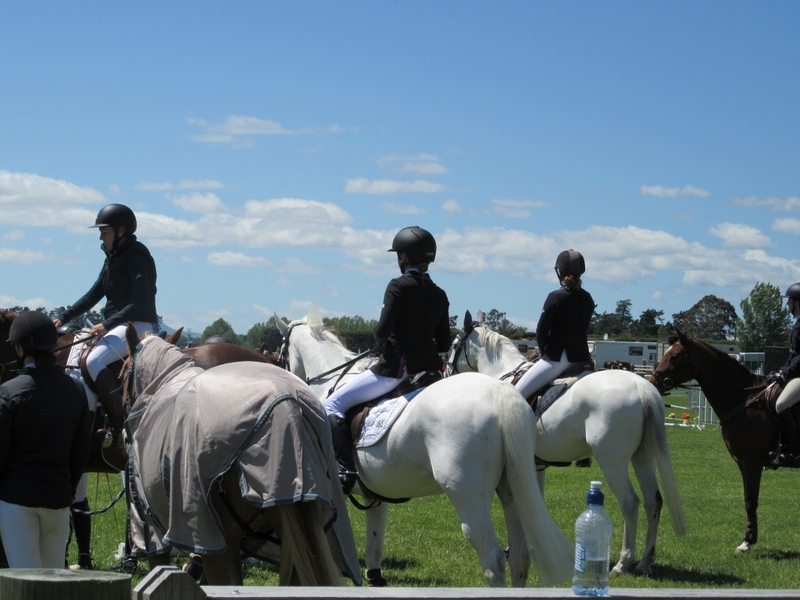 Such beautifully turned out horses and their riders! 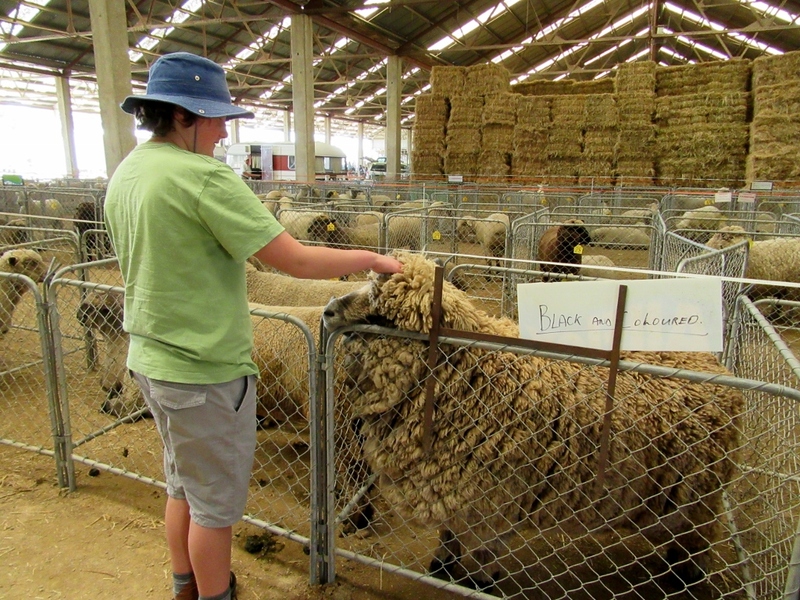 these ladies were doing something equally fascinating, which was skirting and handling the fleece after shearing. They were being judged on their performance and speed. 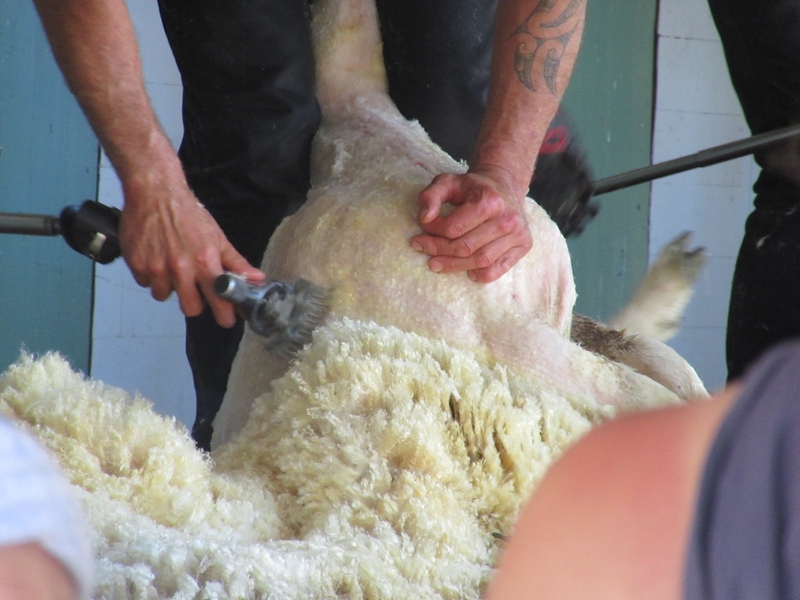 It was also their job to take the fleece off the platform and keep the floor around the shearers clean of debris. 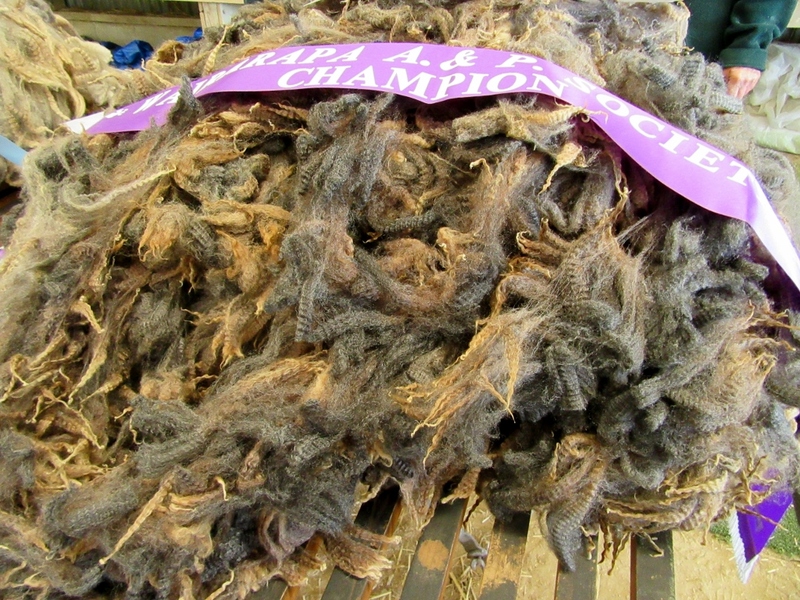 Fascinating to see the fleece able to be laid out on the table all in one piece after it came off the sheep. Lovely clean wool coming off the sheep. 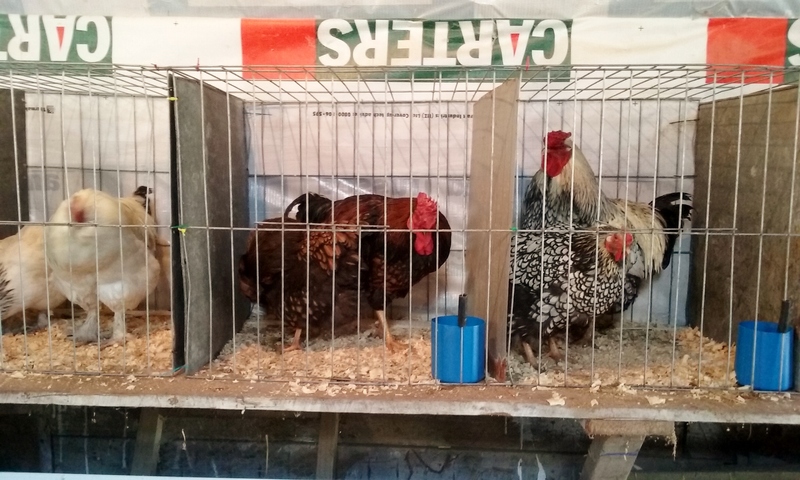 And here they are, post haircut, waiting to go back to the farm. 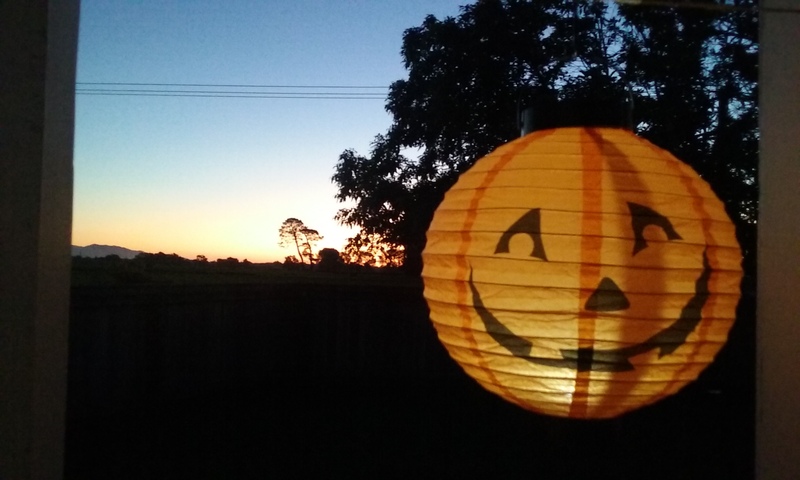 We went home and decorated the front yard for Halloween, but unfortunately, it seems that trick or treating is not a popular thing here in the Wairarapa, and we got no visitors! The young man was most disappointed. We thought this year that we would stay home and hand out treats instead of venturing out. I’ll have to investigate options for next year! Still, it was a lovely day, and we had a beautiful ending as well. If you celebrate Halloween, a Happy Halloween to you, and may your kids get lots of candy! 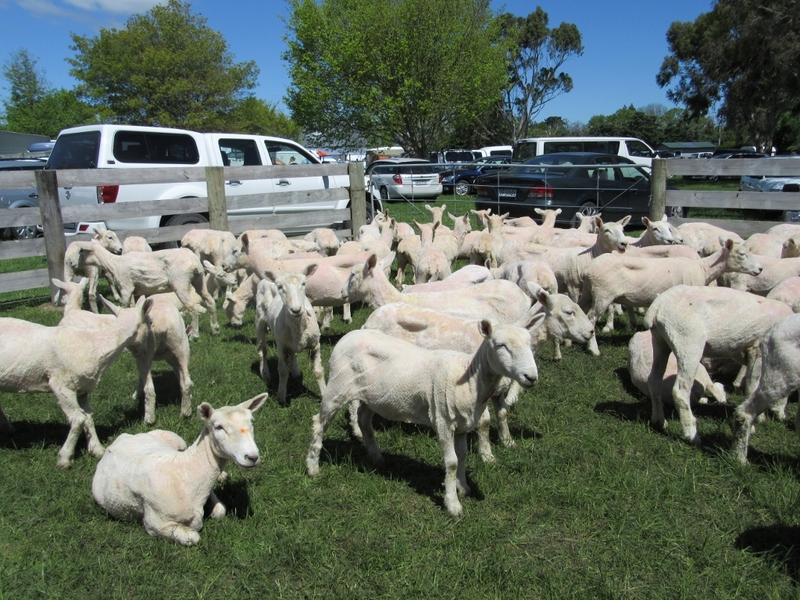 Categories: Rural lifestyle, Wool | Tags: country fair, Knitting, New Zealand, New Zealand wool, rural lifestyle, sheep, Wairarapa, Wool | Permalink.